Home » Website Building » WordPress » How to Connect FileZilla to Bluehost FTP Server? How to Connect FileZilla to Bluehost FTP Server? In our previous article we discussed how to setup a FTP account in your Bluehost account. In this article we will see step by step process of how to connect FileZilla to Bluehost server using the FTP account created. In order to connect to a web server remotely you need a program to be installed on your local computer. 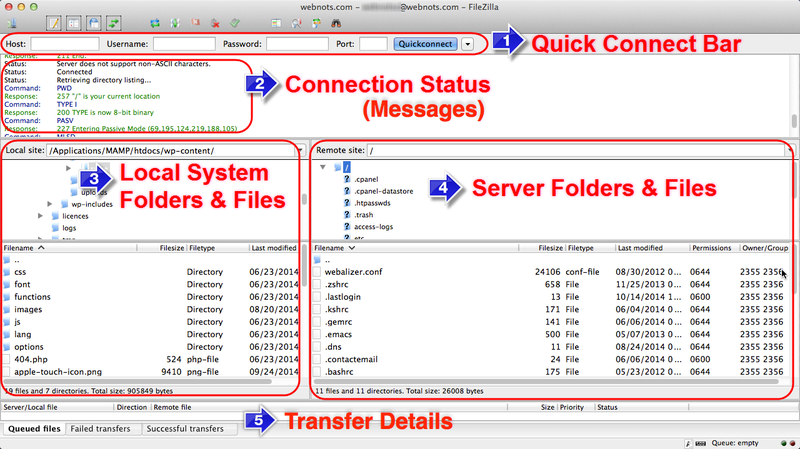 FileZilla is one such a free FTP program available both for a Windows based PC and OS X based Mac. Click on the quick download link for Windows or all platform as per your need to get the latest version of the software for free. You will see the download button again and clicking on which will take you to sourceforge.net from where the software will be downloaded. 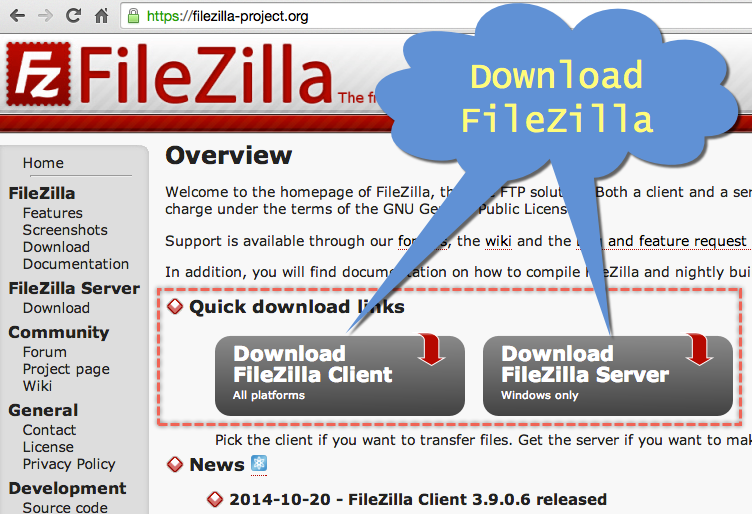 Install FileZilla on your PC or Mac. You also can use other programs like Cyberduck or CoreFTP to connect to your Bluehost server using the same FTP account. Click on “New Site” button in to add your site. Enter a site name, this could be any name not necessarily same as your domain name. For the sake of easiness enter your domain name here. Host – Enter either your domain name registered with Bluehost or the IP address assigned to your domain in your Bluehost account. The domain name entered here will be resolved to an IP address which sometimes may take long time, hence use direct IP address of your hosting server. IP address of your Bluehost account can easily be found in “Stats” sidebar available under cPanel screen. Do not enter Bluehost.com as a host name. Port – Enter 21 as port number. Protocol – Choose “FTP – File Transfer Protocol” from the drop-down. Encryption – Choose “Use plain FTP” from the drop-down. User – Enter user name of your Bluehost FTP account. In Bluehost the FTP user name will be in the format “username@yourdomainname.com”, here you need enter only your “username” without the domain name. Password – Enter the password of your Bluehost FTP account. 4. Click on “Connect” button once you entered all the above details. Quick Connect Bar – as explained above, you can also use quick connect bar to connect to your Bluehost server. Connection Status – whenever you choose any directories, appropriate commands will run in this section and you can see the status of connection. For example, when a connection is lost here you can see a red alert message. Local System – This is your computer folders and files. Whenever you choose a folder all files inside that folder will be displayed in the below box. Bluehost Server – This remote site section shows the Bluehost server where your site’s folders and files are stored. Here you will be able to see modify directories according to the directory access you provided when creating FTP account in Bluehost. 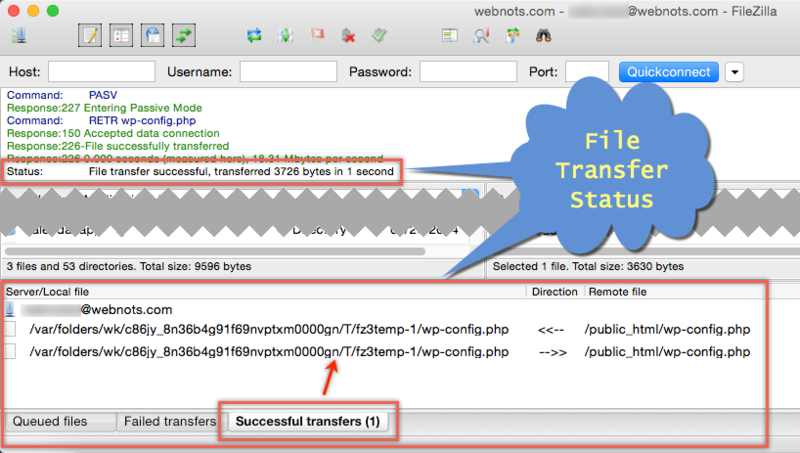 Transfer Details – here you can see three queues to check the status of file transfer. Queued files show the progress of file transfer, Failed and Successful transfers are shown in the next two corresponding queue tabs. Just drag & drop folder or file from one side to another side to copy that folder or file. Right click and choose the option like Edit, Download or Upload. Double clicking on the file will also transfer it to the folder selected in other half section. Check the file transfer status in the messages and queue sections. THANK YOU!! I am an intelligent individual but know NOTHING about programming. Yet, this tutorial allowed me FTP some plugin files to my blog to make it even prettier than it was before. Thank you so much for taking the time to write this. Screenshots are worth a bazillion words.